From the other side of this screen, I can hear your chest fall. But I am here to tell you that your students can create, record, and share their memories using free GSuite apps such as Google Slides, Google Classroom, and Google Photos. I am here to tell you that the only yearbook cost should be the cost to print the yearbook. In Spring 2018, my Compton Jr. High School students sold their high-quality yearbook to 235 students for just $10 presale and then $15. All the written resources are available for free, as they should be, on SlidesYearbook.com BUT sometimes we need a little bit extra. For example, sometimes we need videos with “Play, Pause & Practice” moments. Sometimes we need well-designed lessons in photography, photo storage, graphic design in Google Slides, and yearbook layout. Sometimes we need a collaborative community to inspire ideas. 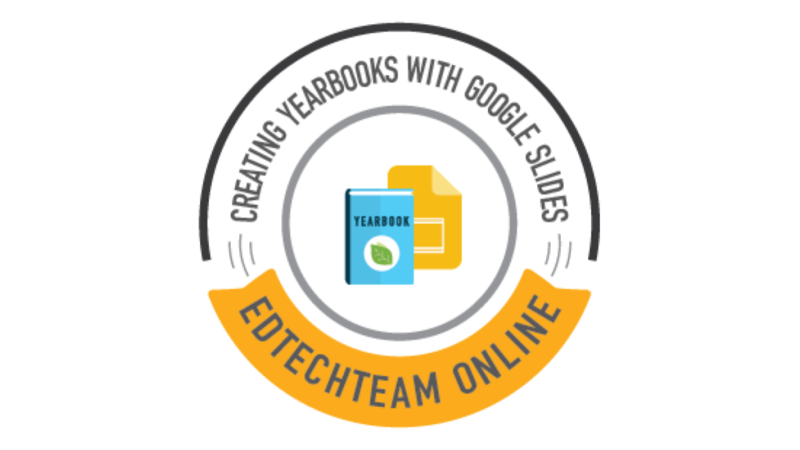 That is where the Create a Yearbook in Google Slides EdTechTeamOnline Course runs to your rescue. The Create a Yearbook in Google Slides Course is 50% off 11/23-11/26!!!!! Your students’ memories deserve to be recorded and shared for future generations. And, your students can do just that by creating their yearbooks in Google Slides.